For men, the timing of their run isn’t really a concern (I’ve heard of male medical students and residents starting their daily runs at 10 pm or later). But for the other 50.8 percent of the population, the streets, the paths, and the taxpayer-funded running trails are effectively off-limits once the sun sets and the streetlights flick on, leaving us to our treadmills or XSport Gyms — if we’re lucky (and motivated enough). Fair? No. But it is the current reality. Well, at aSweatLife, we’re not satisfied with that as an acceptable way to live — so we’re partnering with Despite the Dark to take back women’s power to run at night. 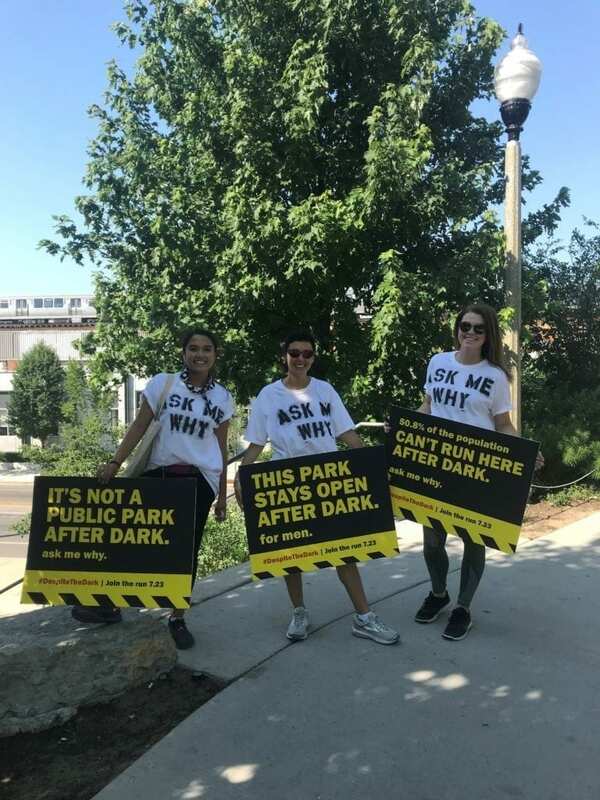 Despite the Dark aims to shed light on issues involving women’s safety while running at night, and to prove a point, they’re hosting an informal fun run on July 23 to give women the chance to run Despite the Dark in a safe, supportive environment. And while the issues at hand will center around women’s safety, men are more than invited to join as well. After all, change will only happen if we involve men and share open discussions about the discrepancies women face when it’s “too dark” to run. Where do I sign up? No need — this is a free event open to everyone, men included! Where will we meet? The 606 Trail at the Damen gate. What should I wear? Sport your favorite athletic attire and running shoes! When and at what time? Monday, 7/23 at 8:30 pm. Can I bring my boyfriend/fiancé/husband/significant other? Absolutely — the more the merrier! But I’m not a good runner… This is a totally casual event, and we’ll be running and walking all distances and all paces. Just show up, and we’ll find you a buddy to stay with!